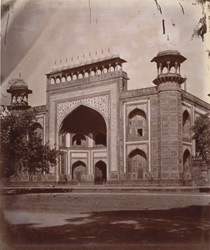 Photograph of the entrance gateway to the Taj Mahal, from the Archaeological Survey of India Collections taken by W. Caney during the 1880s. The Taj Mahal was built between 1631 and 1643 by the Mughal emperor Shah Jahan (r.1628-58) as a mausoleum for his beloved wife Arjumand Banu Begum, also known by the title Mumtaz Mahal. The mausoleum stands at the northern end of enclosed gardens entered via a grand portal, the Great Gateway, at the southern end. This is an exterior view of the gateway from the south-east. It is built of red sandstone and crowned by 26 delicate marble chattri domes. The façade is inlaid with floral, geometric and calligraphic designs in marble, including inscriptions dated 1647 from the Quran, set in the rectangular frame surrounding the central pointed arch.